Nail art can help to complete your look and to make a statement just like jewelry and other fashion accessories. When I used to have my nails done in a salon, I enjoyed having hand painted nail art done by my very talented manicurist. Since I started doing my own nails, I have not been quite as ambitious. I really have only gone as far as using glitter or confetti nail color and crackle nail polish. Although I like the look of the glitter polish, I found that the confetti and the crackle were not a good fit for someone who has control issues like me. I do not like my nail art to be random and unbalanced. Something I have always wanted to try for myself is nail art pens. I can draw freehand fairly well on paper, so why not try it on my nails? Yes, I worry about how well I would be able to draw with my left hand, but I still want to give it a try. 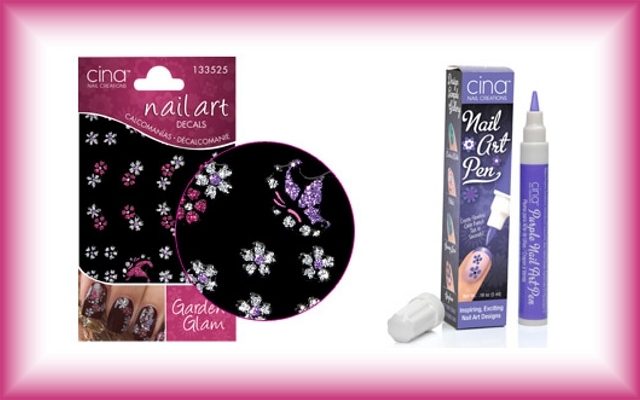 I came across Cina Nail Art Pens while searching for quick drying nail polish online. Then while I was checking out these beauty supplies on the Image Beauty website, I stumbled upon a wide selection of Nail Art Decals also made by Cina. I rather liked the various glitter and crystal decals. Although I am not a huge fan of a lot of bling, a tiny bit on my nails done right could be both pretty and fun. Have you ever tried doing your own nail art? I would love to hear your success stories and would like to know which products are your favorites.